How was the Renaissance a turning point for the way Europeans thought? 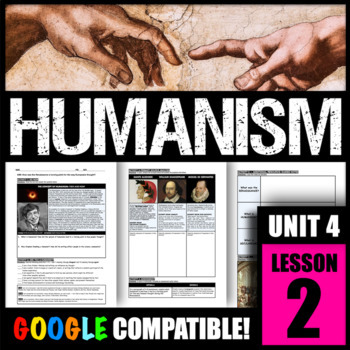 ACTIVITY 1 -- DO NOW: Students will read a text and answer questions that define the terms humanism and secularism. 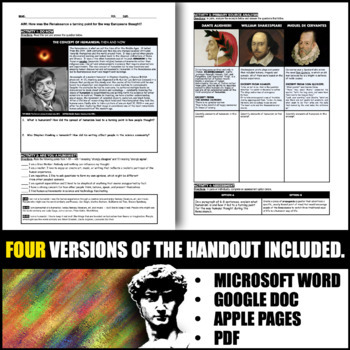 ACTIVITY 2 -- GRAPHIC ORGANIZER: Students will complete a graphic organizer where they identify examples of humanism in the works of Dante, Shakespeare, Cervantes, and Machiavelli. ACTIVITY 3 -- ASSESSMENT: Students have four options for what they'd like to submit as an assessment on looseleaf. 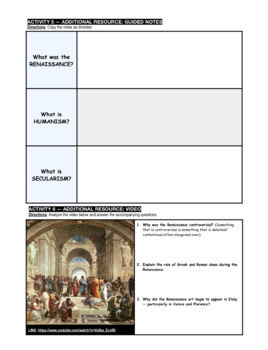 ASSESSMENT: Students may complete one of the options for assessment, or answer the AIM using the R.A.C.E.S. format (FREE Download Here). 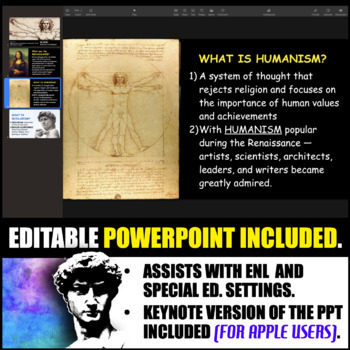 ADDITIONAL RESOURCE INCLUDED: PowerPoint with slides to define the terms for students as you go over Activity 1.